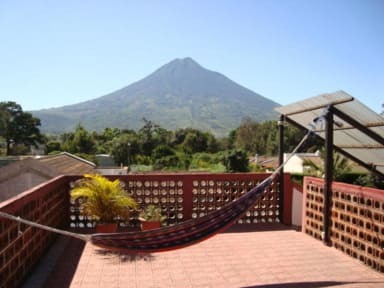 The house has a big rooftop terrace with amazing views of Antigua and the surrounding volcanoes. There is a TV room with TV and DVD-player and lots of movies, fully equipped kitchen and free wi-fi. We also offer free baggage storage and lockers in the dorm rooms. In the private rooms bed linen and towels are provided. In the dormitory rooms we only provide the bed linen but no towels. Please note that our twin rooms have at least one double bed. So it doesn't matter if you book a double or twin room, the room types are interchangeable! We offer shuttle services (pick-up / drop off) from the airport, any bus station in Guatemala City, or any other location in Guatemala. The price depends on arrival time and number of people so please send us an email with the flight information to give you the price. To arrange the airport pick-up we do ask for payment in advance, via paypal. After you make the reservation you can contact us via e-mail for details. Please contact us for prices for pick-up from other locations. Please advise about arrival time. Please email or call in advance if you are likely to arrive during our closed reception times 22:00pm to 8.00am, so we can let our night guard know who we are expecting (arrival is possible any time). Please pay the remaining balance in cash upon arrival (we do not accept credit cards). Important: We do not accept credit card payments, please pay in cash only (either US$ or Quetzales). Lovely hostel with great staff and very clean. Cheapest private room we could find and two double beds, too! Juan the barman on the roofbar is an absolute legend too and a credit to the hostel! Extended our stay twice here - super secure at night and night porter is very friendly. Kitchen gets kinda crowded and not really a party hostel but there's so many places to party nearby it's no problem. Highly recommended. Excellent, kind staff! Very quiet hostel. Great place to rest after long travel days. Love the roof deck! 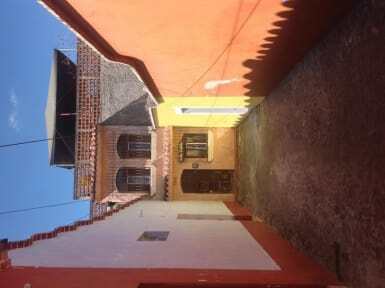 Well-located to city center. Recommend! Great place to stay in Antigua. Danielle is super friendly and helpful with whatever you need. You can pay by PayPal. Cool rooftop patio, clean rooms with lockers. Decent bathroom. Overall a really positive stay. Decent cheap option in Antigua. Clean and tidy if a little dated. Comfy beds, nice rooftop and we'll equipped kitchen. If you’re looking for party or a social place to meet people, keep on looking. This hostel is very quiet! They do have a beautiful rooftop and is probably the cheapest place in Antigua! Pretty average when it comes to facilities over all. I met some cool people here. Place is ok, could be cleaner. Very basic, but for the price its a good deal. Not too far away from centre and in safe area. It was a nice stay. Kitchen is kind of small and needs more cooking tools, will be nice to have bigger common areas. Nice rooftop patio to hangout but dont know when the bar actually opens. The staffs are just soso, depends on whos working, I got more information about the town from another hostel that I didnt even stay in. This might be more of a youth hostel, some guests are just not very considerate with cleanliness and noise in the common areas. When we went to pay the guy at reception did not have the correct change and didn’t take card payment. He demanded that we pay and get short changed 30Q because he didn’t have the correct change... if you dont take card and don’t have the correct change you cannot short change the customer - that is your fault. And apparently someone had just paid in 10Q notes which meant he was lieing through his teeth and actually had the correct change but was trying to scam us!! Do not stay here! !